Buried Montigny Communal Cemetery, Somme. Mrs. Lee, of Sykeside Farm, Haslingden, has received from an officer a letter intimating that her son, Pte. 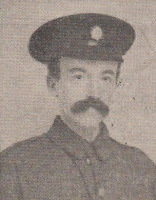 Edward Lee (39) of the Motor Transport, was killed by a shell on May 19th. Deceased worked on the farm up to joining up, in April 1916, and was connected with St. Mary's R.C. Church. He has two brothers still serving. Robert, who is in the Royal Engineers, and was formerly a butcher, voluntarily enlisted on March 9th, though he is now 45 and has been in France three years. Tom, who is 41 and in the Machine Gun Corps, joined up two days after Edward. All are single. Edward was on leave early this year, returning to duty on February 13th. The officer who conveys the information of his death says:- "He was killed in the execution of his duty, which he always did uncomplainingly and well. His loss will be greatly felt in the section. He was one of the quiet men who could always be relied on. I deeply feel for you in your bereavement, but trust you will think of him as one who died that England might live and enjoy the blessing of freedom."